We had to make the most out of today because of our “short” weekend. We were too tired last evening to do much other than a load of clothes. 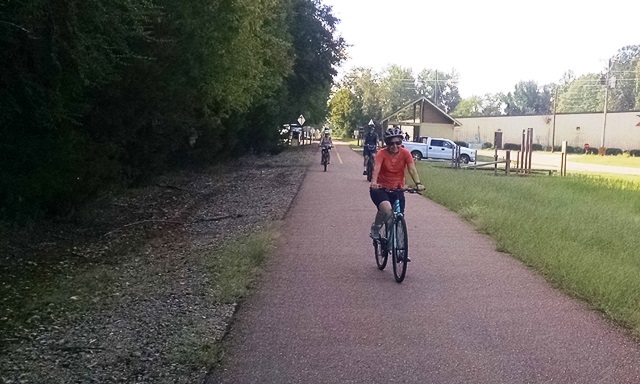 Today, our dear friends Barry and Donna drove over from home and we met them in Pontatoc, MS, along with Mariel and Shannon for a bik e ride on the Tanglewood Rail Trail. We really enjoy the rail trails. The ones we have ridden have generally been well maintained, in very pretty areas, and they usually have more gradual inclines because, remember, the trains had to climb those hills too. 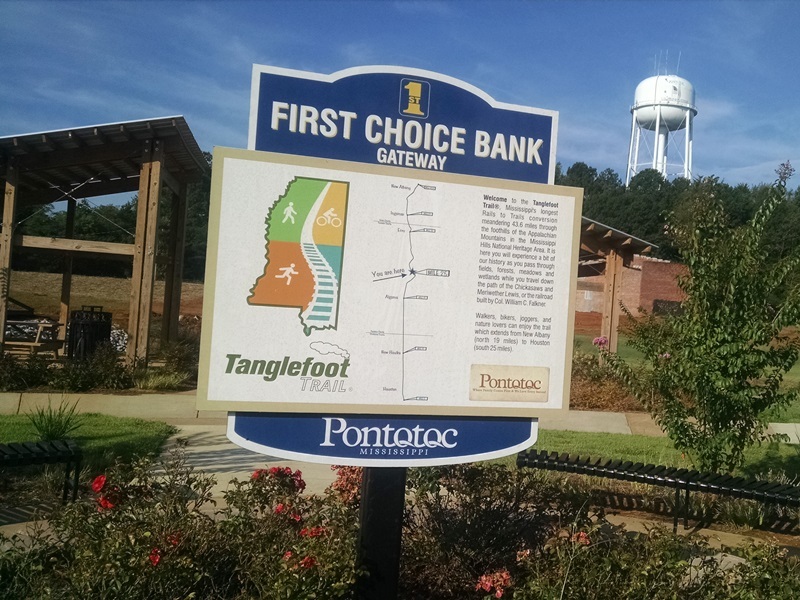 Today we started at the Pontotoc Gateway which is at MM 25 of the trail and road north to Ecru. The entire trail is 40 miles. We didn’t have a set distance for the ride today but had thought we might go about 10 miles out and then back. The ride out seemed pretty easy, first through town and then out through soybean and cotton fields. A nice ride. We stopped at the Ecru whistle stop for a little water and rest break and then road on. Unfortunately, we weren’t too much further up the trail and Max had a flat tire. He ran over a very sharp object and punctured his rear inner tube. He was able to pull it out of the tire and then removed the wheel and placed a patch on the tube. He used our little portable pump to air the tire back up and then tried Barry’s and Shannon’s but could never get it fully inflated. We didn’t know how long the patch would hold so we headed back toward the truck. That was when we discovered we had had a tail wind going out and were fighting a head wind going back. We all also agreed that it seemed that maybe we had been biking slightly downhill because it seemed like we were having to pedal harder and slightly uphill on the way back. Besides it had gotten pretty hot. Maybe it was a good thing Max had a flat before we got too far away. We ended with 15.5 miles round trip. A good ride and a pretty day. After loading the bikes we headed into town for lunch. Donna had found a Chinese restaurant that sounded really good and we were all set to try one of their appetizers. 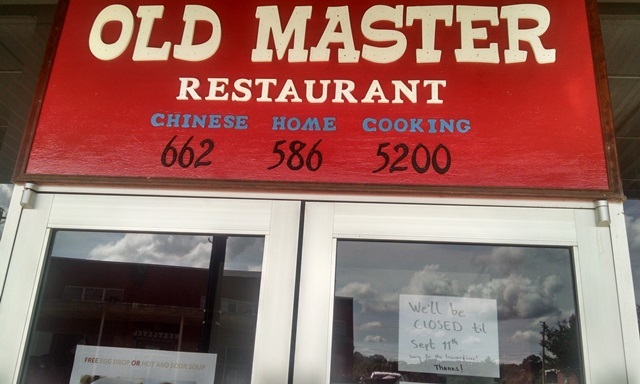 However when we arrived there was a note posted that they are closed until September 11. 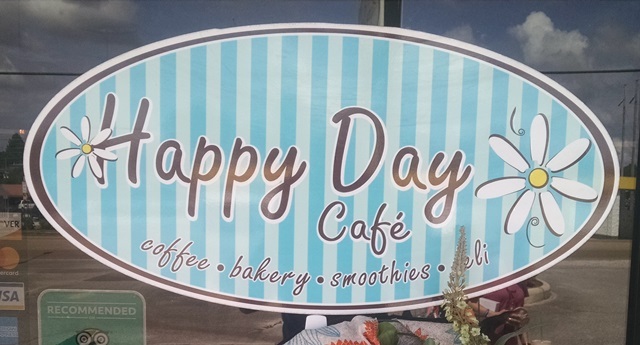 We all pulled out the cell phones and settled on Happy Day Cafe. It’s also a bakery, so that’s not bad. Cute little place with friendly and attentive staff. We all had good sandwiches and then some baked goods and specialty drinks. We had a banana/strawberry smoothie that was very good and brought home a cupcake and some cinnamon buns for tomorrow’s breakfast. It was a fun morning with good friends. So glad Donna and Barry made the trip over. We are missing them. After getting back to Oxford we made a grocery store stop and then home to finish the laundry. We still had to do some walking because we didn’t have our steps in for the day. Glad Mariel came over to ask us to walk with her. Otherwise, we might have gotten lazy. Even with the 15 mile ride we still got over 10,000 steps. We are feeling better since we have returned to the habit of getting more exercise. It was a good day! Thanks Donna and Barry and Mariel and Shannon for joining us.